Home » Archive by Category "Cabins near Dollywood"
We all know that dogs are man’s best friend, so why not spend your next vacation in the Smoky Mountains traveling with your best friend and enjoying the beauty that our area has to offer. However, if you still aren’t sure, read our reasons why we think staying in a pet friendly Gatlinburg cabin can greatly improve your next trip to the area. It’s hard to believe that it wasn’t that long ago when the only way to keep in touch with friends and family when you were on vacation was to send postcards or call them on the telephone. Today, all is takes is a few clicks of a button and you can text, email, Tweet, Facebook, Snapchat or whatever else is popular to stay in touch with your loved ones. There isn’t anything quite like a relaxing trip to the Smokies, especially one where you can bring the whole family. Besides, we already know that having a dog around is a great stress reliever, so why not make your next getaway even more relaxing by enjoying a pet friendly Smoky Mountain vacation. Did you know that scientists say that more people fall in love in autumn than any other season throughout the year? If that really is the case, then isn’t fall the perfect time of year for you and your loved one to plan a romantic Smoky Mountain getaway inside a Gatlinburg cabin? Two popular classic car shows come rolling into Pigeon Forge this September: Shades of the Past Hot Rod Roundup and the fall Pigeon Forge Rod Run! Both offer chances to show off your car, meet with other car enthusiasts and win some amazing prizes! Did you see the celebrity who made her way to Pigeon Forge last week? Do you have plans for Memorial Day Weekend 2014 yet? Make plans for a Memorial Day Getaway to Pigeon Forge, Gatlinburg or Sevierville with Aunt Bug’s Cabin Rentals! If you’re in the Pigeon Forge, Gatlinburg and Sevierville area for Memorial Day Weekend there will be countless outdoor activities to enjoy and time to take in the natural beauty of the area. You can see area musicians performing on the sidewalks of Gatlinburg and enjoy plenty of fine dining serving authentic Southern food. The weather is warm enough to enjoy cooking out with family and friends and at night you can enjoy the countless variety shows in the area. 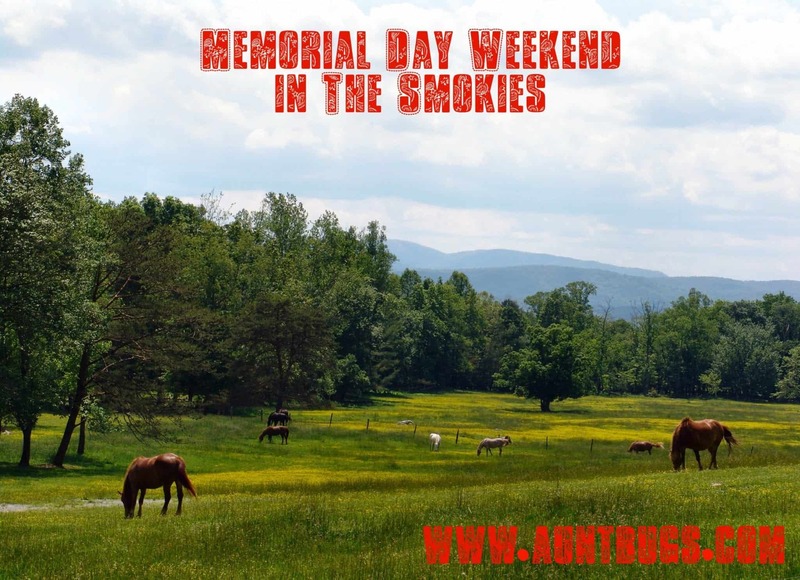 There are plenty of planned events going on for Memorial Day Weekend 2014 in The Great Smoky Mountains! Our outlet malls always have great sales during the holidays! Pigeon River Crossings is having a Memorial Day Sidewalk Sale May 22-26! Shop ‘til you drop and update your Spring and Summer wardrobe at discounted prices this Memorial Day Weekend! May 24 begins Dollywood’s Barbeque and Bluegrass Festival! Dollywood will have the greatest bluegrass bands performing and scrumptious Southern dishes to dine on. You’ll be able to sample the best pulled pork, ribs and chicken you’ll find anywhere! It’s important to take advantage of the 3 day weekend and Memorial Day Weekend is the PERFECT time to visit The Smokies! You’ll find a variety of family fun activities that everyone will love! Aunt Bug’s Cabin Rentals can’t wait to see you this Memorial Day! Many honeymooners, romantics and couples looking to rekindle the fire in their relationship choose Aunt Bug’s Cabin Rentals when planning a lover’s getaway to The Great Smoky Mountains National Park. Aunt Bug’s Cabin Rentals has one bedroom cabins for newlyweds and larger cabins for couples that are bringing along additional family members but still desire their privacy. Get the sparks flying during a steamy soak in one of Aunt Bug’s luxurious hot tubs or take the fire inside in one of Aunt Bug’s cabins that offers an in-room Jacuzzi in the spacious master suite. During your romantic vacation in the Smokies, if you want to surprise that special lady in your life, there are plenty of places to pick up something that will make her eyes sparkle. Local jewelry stores offer the most beautiful necklaces, rings and bracelets you will find anywhere in the world. There are plenty of shopping options in Sevier County for jewelry; from outlet shopping in Pigeon Forge to handcrafted one-of-a-kind pieces in The Gatlinburg Arts and Crafts Loop. Let our friendly staff at Aunt Bug’s help you navigate the path to her heart. You can smell romance in The Smoky Mountain air. The wildflowers lend their own unique fragrance to the air, while local flower shops craft perfectly constructed arrangements for a bouquet, boutonnière, corsage, centerpiece or whatever your heart desires. Let Aunt Bug’s know what type of romantic occasion you are planning so we can assist you in matching you with the perfect florist, place an order ahead of time and we can even have the flowers waiting for you in the cabin. In The Great Smoky Mountains you’ll even hear the love radiate through the mountains with the sweet sounds of local musicians. Couples of all ages can enjoy a special brand of Appalachian music that can only be heard here. There are musicians from all over the world who play only for tips, as well as performers at local shows that will sing their hearts out for you. Aunt Bug’s will keep you up to date on local concerts and which shows we recommend while you’re in the area. Aunt Bug’s also offers the most comfortable, top-of-the line beds and bedding when you’re ready to turn up the romance another notch. Wake up to a beautiful morning with your sweetheart in of our luxury beds. Call Aunt Bug’s today to plan your next romantic vacation in The Smokies! Summer in Pigeon Forge and Gatlinburg gets kicked off this weekend with Memorial Day celebrations all over the area. There are several events scheduled this Friday to help kick off the long weekend and commemorate the holiday.